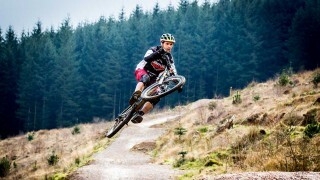 BikePark Wales is the UK’s premier mountain bike park. The 1200 acre site has over 28 descending trails organised in a similar manner to a ski resort. Built in the heart of the South Wales Valleys, BikePark Wales offers mountain bike trails for intermediate to pro level riders. Not just for downhillers, this park is best enjoyed on a trail bike, where swooping blues and rocky, rooty red trails are a perfect step up for trail riders. The park offers a mini bus service which transports you and your bike up to the top in between rides, providing your legs with a little rest before your next descent. For those who wish to reach the top under their own steam a singletrack climb to the summit offers a human powered option. Using the uplift service, the average rider can expect to get 8 to 15 runs in a day. At 4.6 km it’s also possible to cycle a singletrack trail all the way to the top yourself and this will take between 20 and 40 minutes depending on fitness. For those choosing to use the uplift service we highly recommend booking an uplift ticket in advance as more often than not tickets are sold out well in advance. But this shouldn’t stop you from coming to visit, there are almost unlimited day passes (for pedal up riders) and you can grab a multi ride card allowing you to sneak on the uplift if there is space (best used first thing in the morning before the riders with hangovers or long journeys show up.) The trail layout at BikePark Wales enables riders to mix and match their trails by combining different segments together. A rider, for example, may choose to ride the signature ‘Dai Hard’ black graded trail from the top and then easily switch onto ‘Rim Dinger’, a red graded trail as they head back to the uplift pick up point or the centre. This ability to mix and match makes it impossible to get bored. Book a trip now – you won’t be disappointed! Bike hire is available on site but booking is recommended . 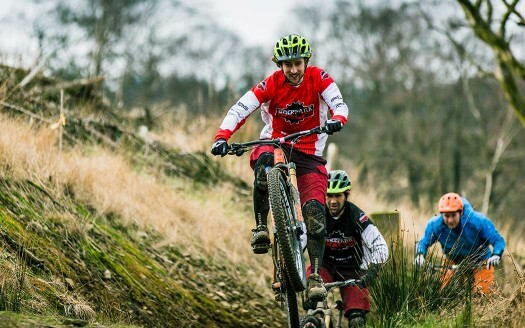 BikePark Wales offer a comprehensive list of coaching courses designed to improve your skills and safety on the trails. The Woodland Cafe is based onsite at the heart of the bike park. It sells everything from full Welsh breakfasts and BPW burgers to tea and cake. There’s also a well-equipped bike shop and repair service on site. You may book the uplift service up to 3 months in advance. There is free parking on site. For those wishing to pedal up rather than use the uplift there is a £6 day entry fee, 100% of which goes to maintaining and improving the trail network. Be aware that in many cases SatNav and Google maps takes you to the wrong place if you use postcode only. Postcode CF48 4TT gets you to the correct roundabout (but after leaving the roundabout turn right not left). Pentre-Bach (1.0 miles), CF48 4BD, 10-15minute cycle. Badgers run is the easiest trail at BikePark Wales, it is a great introduction to Mountain Biking. Sixtapod is probably our most iconic trail on the mountain. Melted Welly is perhaps the best trail to start your day on. Wibbly Wobbly, is rocky and loose at the top, amazingly fast and features a brilliant natural rock gap jump. This has to be the most talked about trail at BikePark Wales. BonneyVille is a natural, switchbacked red route on one of the steeper parts of the mountain. Beast of Burden is our Singletrack XC Climb to the peak of Myndd Gethin at 491m.